Every year, I wish we celebrated Halloween in Australia. Yes, there is more and more stuff being stocked in shops each year for it, but there are still very few people who have Halloween parties or have lollies for kids who want to go trick or treating. We always try to remember to have something on hand for the kids who come to our house on Halloween. What I really want to do though is decorate the front door area and verandah. Make it all nice and spooky. There are so many great ideas online of things to make to decorate for Halloween, glitter pumpkins, Halloween candles etc. I saw this on Buzzfeed and I HAVE to make them! 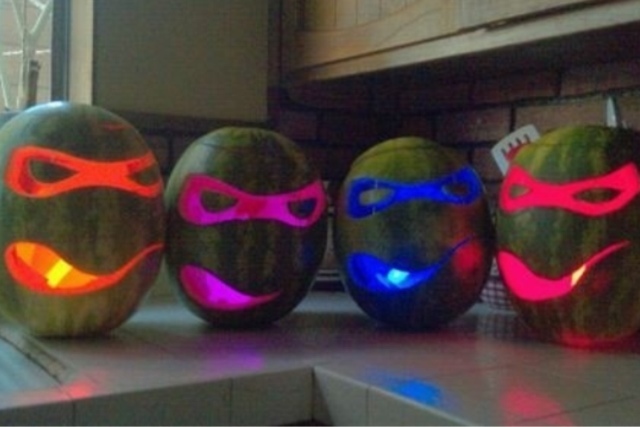 My husband LOVES TMNT and watermelons are so much easier to get than pumpkins in Australia. How cool are these?! Happy Trick or Treating to anyone who is planning to go out this year!